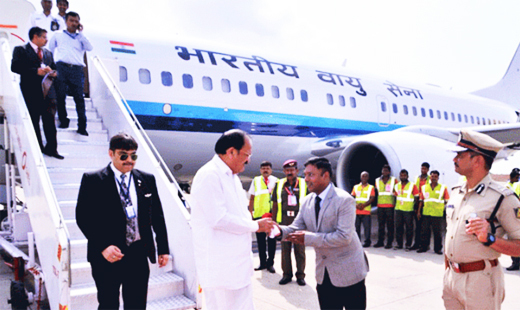 Mangaluru, April 29, 2018: Vice President Venkaiah Naidu arrived at the Mangaluru International Airport on April 29, Sunday by a special flight. He is scheduled to attend the inaugural of the new campus of Kendriya Vidyalaya at Periya in Kasargod. 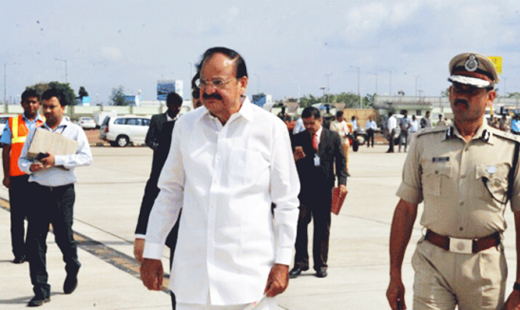 Deputy Commissioner Sasikanth Senthil accorded a warm welcome to the Vice President. Mangaluru City Police Commissioner Vipul Kumar and Mangaluru Assistant Commissioner Mahesh Karjagi were present. Later, he left for Periya through a helicopter. He is scheduled to visit Kochi later today.